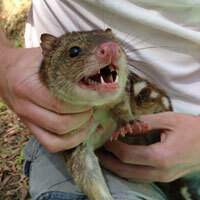 The Mammal Ecology Group (MEG) is made up of staff and students with a passion for mammal research. Northeastern NSW has an impressive, and largely intact mammal fauna, and our research aims to better understand the ecology of these mammals so we can better conserve them. 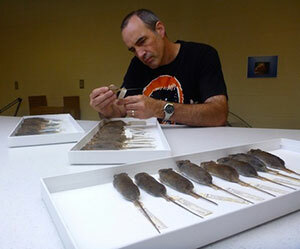 Much of our work also focuses on introduced mammals so we can understand the relationship between native and introduced species, and contribute to solutions to their effective management. Some of our research also extends further afield, including projects that aim to better manage and conserve mammals in Bhutan and Mexico. Through UNE's partnership with the Invasive Animals Cooperative Research Centre, we have several UNE staff and students working on the relationship between feral cats, foxes and wild dogs, and the impact of these predators on native mammals, including the iconic spotted-tailed quoll. Specifically, this project aims to determine if the regional control of wild dogs influence populations of other native and introduced predators, and threatened native prey species. 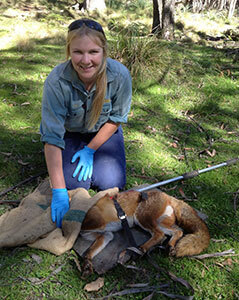 The project will enable improved strategic wild dog management in sheep and cattle regions of Australia. An ongoing focus of MEG is the ecology of mycophagous ('fungus-eating') mammals, and how these mammals contribute to ecosystem health through the dispersal of the spores of truffle-forming fungi to the root systems of forest trees. The various research projects that fall under this banner have extended our knowledge of which mammals disperse spores, and how diverse mammal communities contribute to complex interrelationships between mammals, trees and truffles. In collaboration with research students and agencies in Bhutan, we are studying how mammals use the Biological Corridor network that roved connectivity for Bhutan's protected areas network. Student projects also focus on individual mammal species that are the focus of conservation, including red pandas, Bhutan takin, and large cats, including tigers. This is a new project in collaboration with Mexican grass-roots conservation organisation El Centro Investigador del Sistema Aquífero de Quintana Roo (CINDAQ) that has the primary aim of learning more about cenotes (water-filled sinkholes formed from collapsed subterranean rivers) in order to raise awareness of their importance to mammal species and the environment as a whole. The project is in its infancy, but has already yielded exciting data on the range of mammals accessing these water sources. We are recruiting enthusiastic honours and post-graduate students to undertake field-based research on interesting and elusive wildlife. Please don't hesitate to contact us for more information on these opportunities. Through UNE's partnership with the Invasive Animals Cooperative Research Centre, we have several UNE staff and students working on the relationship between feral cats, foxes and wild dogs, and the impact of these predators on native mammals, including the iconic spotted-tailed quoll. An ongoing focus of MEG is the ecology of mycophagous ('fungus-eating') mammals, and how these mammals contribute to ecosystem health through the dispersal of the spores of truffle-forming fungi to the root systems of forest trees. This is a new project in collaboration with Mexican grass-roots conservation organisation El Centro Investigador del Sistema Aquífero de Quintana Roo (CINDAQ) that has the primary aim of learning more about cenotes (water-filled sinkholes formed from collapsed subterranean rivers). Clayton, J. A., C. R. Pavey, K. Vernes, and M. Tighe. 2014. Review and analysis of Australian macropod translocations 1969-2006. Mammal Review 44:109-123. Vernes, K. 2014. Seasonal truffle consumption by long-nosed bandicoots (Perameles nasuta) in a mixed rainforest-open forest community in north-eastern New South Wales. Australian Mammalogy 36:113-115. Vernes, K. and P. Jarman. 2014. Long-nosed potoroo (Potorous tridactylus) behaviour and handling times when foraging for buried truffles. Australian Mammalogy 36:128-130. Zewe, F., P. Meek, H. Ford, and K. Vernes. 2014. A vertical bait station for black rats (Rattus rattus) that reduces bait take by a sympatric native rodent. Australian Mammalogy 36:67-73. Crook, N., S. C. Cairns, and K. Vernes. 2013. Bare-nosed wombats (Vombatus ursinus) use drainage culverts to cross roads. Australian Mammalogy 35:23-29. Danks, M., T. Lebel, K. Vernes, and N. Andrew. 2013. Truffle-like fungi sporocarps in a eucalypt-dominated landscape: patterns in diversity and community structure. Fungal Diversity 58:143-157. Meek, P. D., K. Vernes, and G. Falzon. 2013. On the reliability of expert identification of small-medium sized mammals from camera trap photos. 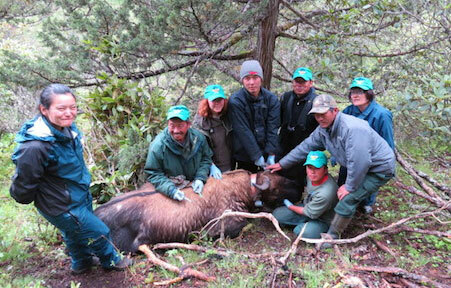 Wildlife Biology in Practice 9:1-19. Dorji, S., R. Rajaratnam, and K. Vernes. 2012. The Vulnerable red panda Ailurus fulgens in Bhutan: distribution, conservation status and management recommendations. Oryx 46:536-543. Pope, L. C., K. Vernes, A. W. Goldizen, and C. N. Johnson. 2012. Mating system and local dispersal patterns of an endangered potoroid, the northern bettong (Bettongia tropica). Australian Journal of Zoology 60:278-287. Smith, A. N., K. A. Vernes, and H. A. Ford. 2012. Grazing effects of Black Swans Cygnus atratus (Latham) on a seasonally flooded coastal wetland of eastern Australia. Hydrobiologia 697:45-57. Castellano, M. A., J. M. Trappe, and K. Vernes. 2011. Australian species of Elaphomyces (Elaphomycetaceae, Eurotiales, Ascomycota). Australian Systematic Botany 24:32-57.
Cooper, T. and K. Vernes. 2011. Mycophagy in the larger bodied skinks of the genera Tiliqua and Egernia: Are there implications for ecosystem health? Australian Zoologist 35:681-684. Dorji, S., K. Vernes, and R. Rajaratnam. 2011. Habitat Correlates of the Red Panda in the Temperate Forests of Bhutan. PLoS ONE 6. Vernes, K., S. Green, and P. Thomas. 2011. 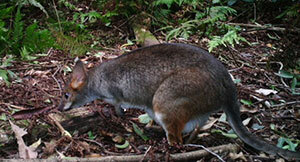 Estimating brush-tailed rock-wallaby population size using individual animal recognition. Australian Mammalogy 33:228-234. Vernes, K. and P. Jarman. 2011. The mammal fauna of the Peter Murrell Reserves, Tasmania, as revealed by truffle-baited camera-traps. Tasmanian Naturalist 131:51 – 61. Vernes, K. and T. Lebel. 2011. Truffle consumption by New Guinea forest wallabies. Fungal Ecology 4:270-276. Danks, M., T. Lebel, and K. Vernes. 2010. 'Cort short on a mountaintop' - Eight new species of sequestrate Cortinarius from sub-alpine Australia and affinities to sections within the genus. Persoonia 24:106-126. Jackson, S. and K. Vernes. 2010. Kangaroo: Portrait of an Extraordinary Marsupial. Allen and Unwin Crows Nest NSW. Vernes, K. 2010. Mycophagy in a community of macropodoid species. Macropods: The Biology of Kangaroos, Wallabies and Rat-Kangaroos:155-169.